“Influenced by the 90s, Established in the 00s, Unleashed in the 10s”, is the beginning sentence on the info sheet from Encypher, a band native to the German Eifel region. And you couldn’t describe their mix of modern metal and alternative rock more aptly. The band has been very busy since their inception in 2008 and has released so far one EP and three longplayers. In 2010 they even won the audience prize of the now defunct Netrock Festival in Luxembourg. The newest album is called 3rd Eye Movement and does certainly not sound like contemporary music. Fat riffs, a whole lot of groove and a sufficient amount of melody are the main ingredients of Encypher’s music. The major influences range from Incubus (the band’s heavier side) to Tool (their mellower moments). Especially the strong vocal performance allows for comparisons to Maynard James Keenan. The songwriting offers light as well as shade though. Rock songs like White Lies Beneath and Face Your Ghosts work very well for the band. Mass Hysteria and Into The Storm, which remind me of current Metallica, are also among the highlights on the album. The only track that is a bit of a letdown is the mid-tempo Stoned In The Glasshouse. The remaining material isn’t bad, but occasionally one has to lament the not so subtle transitions between the different moods that don’t always sound too harmonic and therefore a little bumpy. These are only minor points of criticism, but it would be good for the band to heed them. 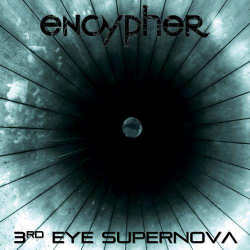 Those among you who were old enough in the Nineties to follow the alternative rock movement should get a nice feeling of nostalgia out of 3rd Eye Supernova. The younger generation is of course also encouraged to check out this band to understand what they missed out on two decades ago, because I also still value the music of Led Zeppelin and Alice Cooper who both released music before I was born.